Accurate and reliable performance data is difficult to acquire safely, particularly in the hostile high voltage environment encountered in utility distribution systems, including CT rated primary metering sites. Quite often testing is not done, allowing installation error, environmental damage, magnetization and manufacturing defects to go undetected. This can result in serious metering deficiencies - problems that can add up to critical kilowatt-hour losses to the utility. The Retriever II Fiber Optic High Voltage Current Probe safely interfaces to the Spinlab 5000 Bird Dog Plus Analyzer to provide the essential current measurements cost conscious utilities need today. With the Retriever II, it is now possible to make in-service ratio, wiring, and burden tests on primary metering CTs. Portable, easily installed on energized lines from the ground using a hot stick. Compact, lightweight - less than 3lbs, including removable hanging fixture. Range 2A to 2,000 Amps Auto Ranging. Uses non-saturable, non=closing tuning fork core design. 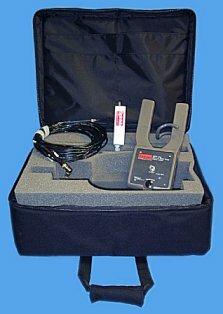 Provides both phase and amplitude data on 5000 or 6000 Bird Dog Plus Analyzers. Electronics link BIL, tested to 230kV, leakage tested to 765kV. Fiber optics immune to HV arcing and corona. Battery powered with auto shutdown feature (within 5 minutes in idle). Fiber cable detachable for easy cleaning, maintenance and safety testing. Used in over 500 electric utilities throughout the world. Backed by over 20 years experience in high voltage power optics.